This Ralph Lauren 100% Pima cotton polo shirt is available with or without signature embroidered pony, and your company logo. Love the quality of Ralph Lauren? A select group of apparel items are available for you to custom embroider with your company logo or event logo. Please note, the polo pony is optional on some items, but not on others. Click here for the Ralph Lauren 2015 custom corporate apparel catalog. The link will be valid in the same place for future seasons also. These are classic Ralph Lauren items which are mostly available year after year. Fairway & Greene men’s polo shirts on sale now with wholesale prices. Quantity discount starts at low 12 minimum. Free custom logo embroidery in one position. Wow! The classic Fairway & Greene solid shirts and Fairway & Greene mini stripes shirts sale is available while supplies last. Do not wait for the best selection of shirts. A recent sale sold out all inventory in one day. Mini Pureformance Stripe Lisle 301221C replaces Men’s Short Sleeve Classic Stripe Lisle 301210. The Fairway & Greene classic stripe polo shirt made with mercerized cotton has been an executive staple for years. It’s been updated with the moisture wicking performance of Pureformance™ fabric. This Luxury Pima cotton provides color fastness and comfort, with the added moisture wicking benefit Coolmax tecnhology. Sophisticated solid color styles are complimented by rich two color tournament stripe and classic combinations. When these are gone, they’re gone forever. About CEOgolfshop.com: We are a wholesale and retail distributor of luxury brands, including Fairway & Green, for corporate, resort, and end-user. Optional custom logo embroidery and imprinting is available on most products. Custom CEOgolfshop is based in South Florida, between Boca Raton and Fort Lauderdale, FL.. Online store http://my.ceogolfshop.com. Download Fairway & Greene corporate apparel catalog here. 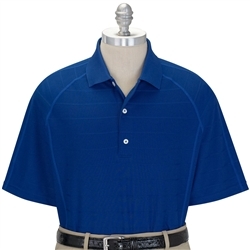 Six colors up to 4XL makes this a fun option for corporate outings. Logo embroidery optional. Black, Dark Sky, Grasshopper, Navy, Night Sky, Real Red, White. Zero Restriction Men’s Ghost Stripe Polo Shirt – Buy it online now.